The most important book we have at our disposal is the Word of God. At The Landing we refer to it as our sword and blueprint for life. We profess every week that we can DO anything it says we can do and that we can BE all that it says we can be. I read it because there something special about books that are God-breathed. God put its content on the hearts of people just like you and me so that we could read it and apply it to our lives. 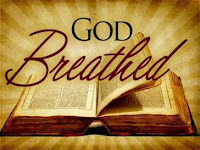 Not only is it God-breathed...it is useful. In a world full of nonsense and useless knowledge its good to know that there are still some things that are useful. The Bible is useful for teaching others and for providing information to others that can help them correct their mistakes. It's also useful in training people to grow in the wisdom and knowledge that comes from God and become fully devoted followers. It's a roadmap through this life and into a life of eternity with God. Following this map guarantees arrival at your destination! The purpose and intent of the book is to equip you and me for EVERY good work that God has planned out ahead of time for us to be involved in. How do we know what He wants us to do? Read the Book! Sounds simple but that is how you get on the path to your potential and purpose. Are you thoroughly equipped? Could you use a refresher course? Check in at your local church this week and take your SWORD! Let the "equipping" begin!